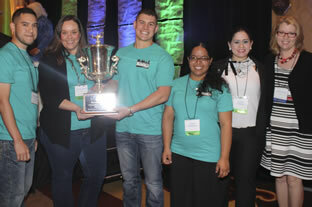 (April 23, 2013) -- The Texas Alpha Pi chapter of Alpha Chi at The University of Texas at San Antonio received the coveted President's Cup at the Alpha Chi National College Honor Society annual convention in Nashville, Tennessee, on April 6, 2013. Alpha Chi awards the cup to the chapter judged most outstanding in the nation. Each nominated chapter must keep track of their activities over a three-year period to prepare its application package. The UTSA chapter received the award for implementing academic and service programs on campus and in the community, sending students and sponsors to the annual conventions, nominating students for society scholarships and fellowships, and encouraging student academic research. The panel of judges noted the variety and quality of programs offered or co-sponsored annually as a signature aspect of this chapter's merit. "We commend the chapter sponsor, Patricia Graham, the assistant sponsor, Charlin Jones, the student officers and the many members who together make this chapter successful," said Trisha Yarbrough, executive director of the Alpha Chi National College Honor Scholarship Society. "Dr. Graham and the chapter at UTSA illustrate Alpha Chi's core values of academic excellence, campus engagement and civic improvement, so I'm delighted they received the President's Cup. Their commitment to enriching campus life and improving their community exemplifies our ideal to 'make scholarship effective for good.'" The impressive traveling trophy will be displayed at UTSA until the 2015 convention. Upon bringing it back for presentation to the next recipient, the Texas Alpha Pi chapter will receive a beautiful trophy to keep as a permanent reminder of the chapter's esteemed status. Alpha Chi is a co-educational honor society inducting more than 13,000 members annually. Juniors, seniors and graduate students in the top 10 percent of their classes on campuses in 45 states are invited for membership. The Alpha Chi chapter at UTSA inducts more than 200 members annually.